The installation Baseco Die! So that I may Live deals with the global issue of organ trafficking and, more spacifically, kidney trading. Through visual art, theory and philosophy, the project connects two relations: “Who may live and who must die?” Michael Focault named the issue of controlling and regulating life”biopolitics”.It is precisely because of biopolitics that a group of people can reduced to bare life, to life without value, as is the case of the Baseco slum in Manila in the Philippines. From history to today’s modern slavery. Who is naive in this case? 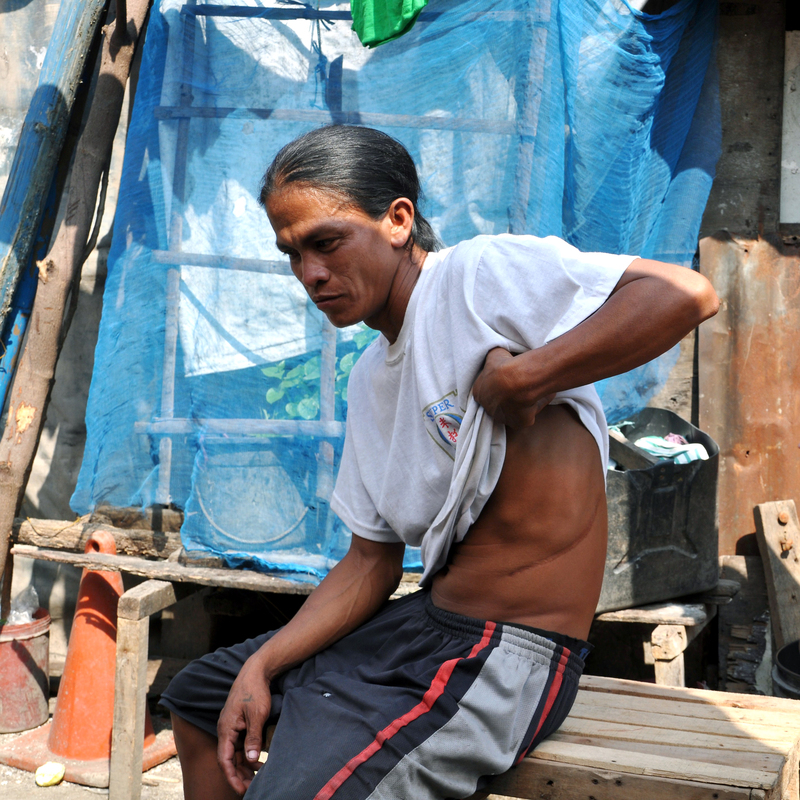 There is something peculiar about the inhabitants of the Baseco slum tattoos and scars from mass kidney sales. The place Baseco slum in Manila in the Philippines has been nicknamed the “Kidney less Island”. Local officials estimate that about 3,000 kidneys have been sold, leading to the question, who will live and who will have to die. Michel Foucault calls for the control and regulation over life biopolitics. The organ trade is most common in Third World Countries. Lack of legislation, a high degree of corruption and the involvement of the leading members of society allow for big profitable transactions in the organ trade. This kind of trade has led to major exploitation and the threat to the life of the poor. According to Giorgio Agamben, kidney sales can be compared according to his thesis that modern society enforces two different models of life. A mere life, present both in the Third and First World, on one hand. Life in Baseco can be compared as mere life. In the First World in the USA and Europe, on the other hand, life with style or arrogant life with a high incidence of kidney illness and failure caused by an over-consumption of an over-abundant and unhealthy diet can be found. Kidney sales at the Baseco slum are largely affected by Christian ideology. Approximately 85% of the Filipinos are Catholics. Sacrifice and charity towards fellow men arise from Jesus’ ideology of life, death and teachings. The thinking pattern of self sacrifice and sharing of the body derive from the Christian faith The Last Supper.The major advent of biotechnology during recent years is of great importance and the great concern for health, eternal youth and investments into the body can be understood as biopolitical technology. Modern biopower does not operate through the threat of death, but by manipulating with life and by encouraging the extending of our life span through organ transplants. Human organs are simply at its disposal in the Third World. What does human life thus mean today? How much is it worth? Can society on all levels be reformed and can a life worthy of a human being be returned thereto? Who is naive in this case? Is there anything plausible left, that a proper, critical concept to subvert the ideology of the ruling imperialistic system, to disprove it and criticise it, can be found? Kidney sellers at the Baseco slum consider themselves heroes for having given the gift of life, for having given life to someone, so to speak. They are not to any extent aware of their situation. The imperialistic claws of biopolitics have robbed them of what they have left, their mere body, under the pretext of religious ideology. Their kidneys have been literally torn from their bodies for small change and they have been convinced of doing something good, of giving life. But who is given life? Those whose kidneys have failed because of over eating. Who will live and who will have to die? How can this be put to an end. © 2015 Institute ERGO SUM - All Right Reserved | Website by MS3 d.o.o.